Judge Bradford H. Charles of the Lebanon Court of Common Pleas recently issued an Order of January 24, 2011 in the case of Dunkelberger v. Erie Insurance Company, No. 2010-Civil-01956 (Leb. Co. Jan. 24, 2011, Charles, J. ), outlining how post-Koken consolidated claims for UIM benefits and bad faith damages are to be handled in that county. Judge Charles granted the Motion of Erie Insurance Company for an Emergency Protective Order and Stay in terms of any discovery requested by the Plaintiff on the bad faith claim. 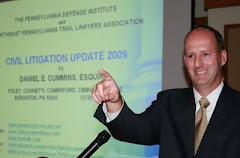 The prevailing defense attorney in this matter was Attorney John Statler of the Lemoyne, Pennsylvania law firm of Johnson, Duffy, Stewart & Weidner. Philadelphia County Court of Common Pleas Judge Alan L. Tereshko has again weighed in on the post-Koken issue of consolidation of claims and proper venue in the case of Gollinge-Motroni v. Machado and Allstate Ins. Co., October Term 2010 No. 002528 (Phila. Co. Jan. 14, 2011, Tereshko, J.). This matter involved a motor vehicle accident that occurred in Lehigh County. According to the information I received, the parties, witnesses, and treating physicians either resided or worked in Lehigh County. However, the Plaintiff filed suit in Philadelphia County against the tortfeasor and her own insurance carrier for UIM benefits. The Plaintiff apparently filed the case in Philadelphia County on basis of the fact that the insurer engaged in business in Philadelphia County. The tortfeasor Defendant filed Preliminary Objections requesting that the claims be severed. The tortfeasor Defendant also filed a Motion for Change of Venue based upon the doctrine of forum non conveniens. The UIM carrier Defendant filed similar preliminary objections. Judge Tereshko first entered an Order transferring venue and then sustained Preliminary Objections severing the claims. The prevailing attorney for the tortfeasor Defendant was Attorney Salvatore Vilardi of the Blue Bell, Pennsylvania office of Cipriani and Werner. The prevailing attorney for the UIM carrier was Kevin McNulty of Gerolamo, McNulty, Divis & Lewbart in Philadelphia.